Some eye-opening real estate market news hit this week: according to a study conducted by Trulia, buying a home in DC is on average 34% less expensive than renting. With that in mind, this week we chose to spotlight three distinctly different homes in DC that span the listing price spectrum...proving that luxury-quality photography and marketing is not exclusive to luxury-priced listings! For the upper brackets market, Bancroft Place is an oasis of tranquility on a premier street in one of Washington’s most prestigious neighborhoods. This elegant, three-story Beaux Arts brick and limestone residence was built in 1907 as the ballroom for the adjacent property. The main floor ballroom/living room - with its 19th century Baccarat crystal and bronze chandelier, 12-foot ceiling, Ionic columns, dentil moldings, and 19th century French rouge marble fireplace mantel - speaks to a bygone era of grand urban living. 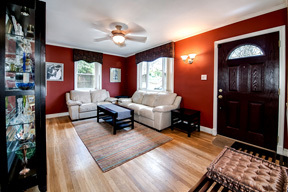 This brilliantly honed 1920s bungalow is located in the trendy Petworth neighborhood. Everything here has been updated and upgraded and the light-filled three level home includes hardwood floors, a wood-burning fireplace, and vintage-period moldings throughout. An updated posh kitchen features stainless steel appliances, gas cooking, neutral quartz, butcher block counters and shaker-style white cabinets. 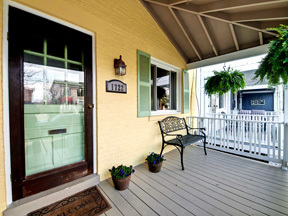 An inviting front porch graces the homefront. A deck and spacious backyard provides additional outdoor space. First time buyer alert! This spacious 1 bedroom Cleveland Park condo is flooded with natural light. This stylish and updated condo offers gorgeous southwestern treetop views and a well-suited floor plan. 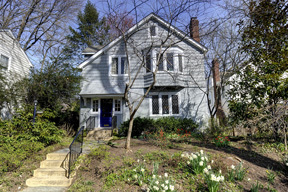 Located steps from the National Zoo, Cleveland Park Metro and trendy restaurants and nightlife of Connecticut Avenue. One Million Buyers Can’t Be Wrong! HomeVisit, a leading provider of marketing solutions for real estate, announced today that over 1 million buyers have viewed homes using its new Virtual Tour system. Additionally, those buyers have viewed an average of 41 photos per Tour visit and have spent an average of nearly 9 minutes inside each Virtual Tour. “These incredible stats tell us what we’ve known all along: Buyers want more photos, better quality images and more content,” said Bryan Vaughan, HomeVisit Founder and CEO. Watch the video below to learn all about these incredible statistics and to see the new HomeVisit Virtual Tour System in action. HomeVisit introduced its new Virtual Tour system earlier this year. Over one year in the making, the Virtual Tour was redeveloped from the ground up, with a host of new features including Fusion Photography, embedded Floor Plan Tour, 360-degree Spherical Panoramic Images, HD Video playing inside the Tour and three different kinds of mapping. The new HomeVisit Virtual Tour touts a completely remodeled and simplified interface that resizes to fit any screen and provides easy one-click access to all tour content. Additionally, all features of the new HomeVisit Virtual Tour work on the iPad, which accounts for nearly 20% of web traffic. Fusion Photography – A refined process of shooting and processing home photos that, simply put, provides images of surpassing quality. The process involves combining three images of varying exposure (light, medium and dark), then fusing the three together to create one richly detailed image. Fusion Photography provides added depth and dimension to every photo. Home buyers and sellers alike can see the difference Fusion Photography can make in Virtual Tours, as well as HomeVisit Print Materials. Floor Plan Tour – An add-on feature available for any Virtual Tour that provides an innovative way for buyers to move from room to room of any home. An intuitive split screen provides a high-resolution floor plan on the left, with corresponding HomeVisit photography on the right. The Floor Plan feature is a great way to give buyers spatial perspective akin to being inside any home. 360-Degree Spherical Panoramic Images – Shot with the same high-resolution camera as our Fusion Photography, these special images allow the buyer to spin 360 degree in any room or space with perfect clarity and detail. Panos capture the full scope of any room as well as provide full floor to ceiling detail. HD Video Playing Within the Tour – HomeVisit can automatically generate High-Definition Video from Fusion Photography or provide Professional Production Services using a wealth of state-of-the-art equipment to capture live footage of any home. Recent studies prove that video has become increasingly important in the home buying process. Three Full Screen Interactive Mapping Solutions – The HomeVisit Virtual Tour shows buyers exactly how any home fits into a neighborhood by utilizing three different mapping technologies: Google MapView, Google StreetView and Bing Bird’s Eye View. Buyers can pan and click a map to check out a home’s surroundings as well as get a 45-degree flyover view. Embedded High-Resolution Printable Flyer – HomeVisit automatically embeds a full-color printable high-res version of the home’s corresponding Print Brochure. >> Learn more about HomeVisit's new Virtual Tour System. Questions? Call us at 703-953-3866 or email us at service@homevisit.com. Download Your HomeVisit Photos With One Simple Click! + Now Available with All Photo Packages, At No Extra Cost! At HomeVisit we are always looking for ways to make the marketing of your listings easier and more efficient. Now, your HomeVisit photos are just one simple click away, at no additional cost! When you receive the email notification from HomeVisit that your images are ready for review, you will also receive a link in the notification email that enables you to download all of your listing's photos. Your HomeVisit photos are now posted in a zip file so you can download them immediately and post to MRIS if needed. We hope that you enjoy and greatly benefit from this brand new service enhancement! Built in 1929, this Tudor-style mansion nestled between Embassy Row and Cleveland Park is an exquisite mix of classic architecture and modern interior design. The 10,000-square-foot home has four levels, sits on a 0.35-acre lot and features six bedrooms, seven full bathrooms, an expansive terrace overlooking a manicured lawn and gardens, a full-sized gym, wine cellar, two car garage, and motor court. Real all about today's Wall Street Journal House of the Day here. HomeVisit helped Washington Fine Properties convey the essence of this spectacular home with Elevated and Fusion Photography, as well as a Floor Plan Virtual Tour and High-Definition Video Tours. Wall Street Journal House of the Day: Tudor With a Twist in D.C.
HomeVisit is proud to feature The Rosedale Farmhouse, the oldest home still standing in Washington. This historic home, presented by Marin Hagen & Sylvia Bergstrom of Coldwell Banker Residential Brokerage, is now listed on the public market for the first time in recent history. We invite you to tour a home unlike any other right now with our Industry Leading Virtual Tour featuring Fusion and Elevated Photography. This 5,200-square-foot home has four bedrooms, 10 fireplaces and a swimming pool with views to the National Cathedral. It is on the market for $5.3 million. The Cleveland Park landmark home includes the original Stone Cottage, which dates to the 1730s. The Cottage became the original kitchen when the main Farmhouse was added in 1794 by Revolutionary War hero Uriah Forrest and his wife Rebecca. Standing as the “heart of a large farm and estate lying just north of Georgetown” for most of its history, the Rosedale Farmhouse and grounds were preserved in an award-winning community effort in 2002, and the Farmhouse has since been lovingly restored and renovated with careful attention to historic details by its current owners, who also added a 60’ pool and pool house. Facing south toward Newark, the house, beautifully landscaped garden and pool enjoy sweeping views of the National Cathedral, with magnificent south, east and west light and a lovely shared private tennis court. The three-acre Rosedale Conservancy, carefully maintained and preserved, buffers this quiet oasis, providing a unique urban experience. The countryside in the heart of the city. 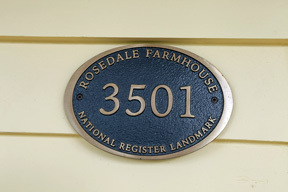 There is no other home in Washington, DC like the Rosedale Farmhouse. From the early years of the Stone Cottage's construction in the 1730's, the Rosedale Farmhouse has hosted presidents and residents alike. Historic events at the house have included frequent visits by Pierre L’Enfant, a dinner the Forrests held for President John Adams in 1800, a long visit by Aaron Burr after his fateful duel with Alexander Hamilton, sale of large parts of the original Rosedale property for the streets and parks of lower Northwest DC, and use of the house by Elian Gonzalez and his family in the late 1990’s. Learn more about the power of HomeVisit! Want to learn more about featuring one of your upcoming listings in this space? Contact our Sales Department at 703.953.3866. Be sure to ask about our special discounts for new products and services. + Tour This Ashburn Home Now With The HomeVisit Floor Plan Tour & HD YouTube Video! HomeVisit presents 19751 Spyglass Hill Court in Ashburn, Virginia, listed by Greg Wells of RE/MAX Select Properties Inc.. This home is open this Sunday, April 1st, from 1-4pm, but we invite you to tour this house right now with out Floor Plan Virtual Tour and our High-Definition YouTube Video, both featuring Fusion Photography. This beautiful home is situated at the end of a cul-de sac on a 1/2 acre lot and features a huge, fenced backyard. Beautiful Home on a 1/2 Acre Lot! You can see it in person this Sunday from 1-4pm, but HomeVisit offers three great ways to tour this listing right now. First, our Floor Plan Virtual Tour puts you inside the home. Simply mouse over the icons on the floor plan images and the corresponding photos display. Next, we offer the High-Definition YouTube Video. Sit back and enjoy the superior Fusion Photography as we take you through the home, room by room. Finally, the industry best HomeVisit Photo Tour gives you a flexible and fluid interface to view the Fusion Photography in all its stunning detail. Thank you to The Greg Wells Team for the opportunity to showcase this wonderful home! Visit The Greg Wells Team Online. 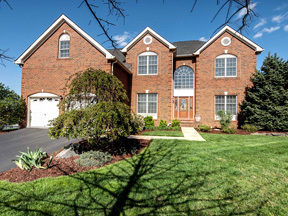 + This Spacious McLean Home Has It All! Watch The High-Def YouTube Video Tour! Today we're featuring 7231 Addington Drive in McLean, Virginia listed by Barbara & Diane Lewis of Long & Foster Real Estate, Inc! This stunning five bedroom, four and a half bath home is loaded with comfort and luxury! Located on a quiet cul-de-sac in the Evans Farm neighborhood, this home is loaded with fabulous features. Those include window-filled walk-out lower level recreation room with expansive wet bar which leads to a gorgeous patio courtyard equipped with an outdoor Viking rotisserie grill. On the main level, the spacious gourmet kitchen, also featuring Viking appliances and a luxurious sub-zero refrigerator, includes a large breakfast room and beautiful sun room. The family room features a beautiful stone fireplace and custom built shelving for an entertainment center. Upstairs, the master suite features refined details such as a coffered ceiling, a separate sitting area and office room, two walk-in closets as well as a luxury master bath. For this listing, The Lewis Team utilized the expansive power of HomeVisit's online marketing capabilities, including a Full Fusion Photography Photo Shoot. We offer three great ways to tour this listing right now. Thank you to The Lewis Team for the opportunity to showcase this wonderful home! Visit The Lewis Team Online. + Featuring Fusion Photography, The Industry's Best Virtual Tour, HD Video & Premium Print! UPDATE: We received word today that this listing is now UNDER CONTRACT, having been on the market for only 5 days. Congratulations to the Ditto Group! Welcome to 10104 Ashwood Drive, in Kensington, Maryland, listed by Gary & Diana Ditto of Long & Foster Real Estate, Inc! This charming four bedroom, three bath brick Cape Cod located in Parkwood has undeniable curb appeal! The current owners added a wonderful master bedroom suite on the 2nd level offering a luxurious bedroom and bath with a huge walk-in closet or 4th bedroom depending on your needs. to a light filled dining room and a fully finished lower level recreation room and separate office. The exterior has been wonderfully landscaped both front and back with a fully fenced level back yard. 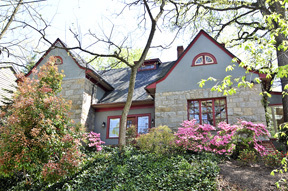 Just blocks from the Kensington Parkwood elementary school and Rock Creek Park – the location is ideal. 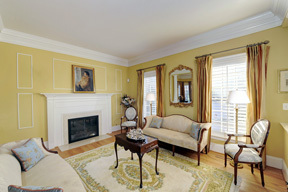 Also note the convenient location to Grosvenor Metro, NIH, Navy Medical Center and Strathmore Hall just minutes away. For this listing, HomeVisit provided The Ditto Group with a full Fusion Photography package, including the industry's best virtual tour and high-definition YouTube video, as well as distinctive four page horizontal brochures. Gary and Diana took the time to share with us their thoughts: "The Sellers were very happy with the marketing services provided. They loved the photographs and really thought brochure was top notch." Thank you to Gary & Diana for the opportunity to provide our services! It's been our pleasure! + Featuring Two Beautiful Northwest DC Homes! Welcome back for another installment of Best New Listings, where we shine a spotlight on a few specially chosen homes that have just hit the market and are open for viewing. This week we've selected two magnificent homes in Northwest Washington, DC. First is 4349 Klingle Street, NW presented by Roby Thompson of Long & Foster Real Estate, Inc.. This wonderful Wesley Heights 1923 charmer has great original details including leaded glass windows, warm hardwood floors, and a 1999 three story addition for today's living. The floor plan features the perfect flow for entertaining - open gourmet kitchen with stainless steel appliances and granite counters overlooking sunny family room and large deck, huge formal dining room, grand master suite and three additional bedrooms upstairs, great finished basement with 8' ceilings ideal for au pair or teen suite. This is a stunning residence with superlative design. View the HomeVisit Virtual Tour and the High-Definition YouTube Video, both featuring Fusion Photography. See the home in person this Sunday, March 25th, from 1pm to 4pm. This week we are also featuring 2728 Chain Bridge Road, NW presented by W. Ted Gossett and Florence Meers of Washington Fine Properties.. This residence is located in a private enclave of homes in the heart of the prestigious Kent neighborhood and directly across the street from Battery Kemble Park. a formal Dining Room with access to the expansive rear Deck, a Gourmet Kitchen with granite counters and stainless appliances and a powder room. The Master Suite on the second level is complete with an en-suite Master Bath with a tub, separate shower and a walk-in closet. There is a 2nd Bedroom and Bathroom on the second level. The third bedroom located on the top level features vaulted ceilings, built-in bookcases and an en-suite bathroom. There is a fourth bedroom/den with fireplace, a full bathroom and a two car garage on the ground level. View the HomeVisit Virtual Tour and the High-Definition YouTube Video, both featuring Fusion Photography. See the home in person this Saturday, March 24th or Sunday, March 25th, from 2pm to 4pm. 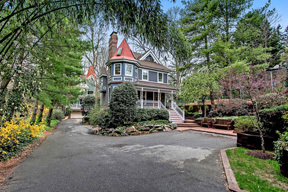 + Featuring Historic Del Ray Charmer, Magnificent Potomac Home & Distinctive Crestwood Tudor! As the Spring market begins to heat up, we'd like to invite you to take a look at three diverse HomeVisit offerings, all open for viewing this Sunday, March 11th. First is 1722 Price Street, presented by Gina Baum of Keller Williams Realty. This beautiful 2 bedroom, 1.5 bath house is perfectly located in the heart of Alexandria’s coolest neighborhood, Del Ray. It is just steps from the popular restaurants and retail shops on Mt Vernon Ave. Enjoy summer days watching kids play and sipping lemonade from the front porch. Go inside this listing with HomeVisit's Floor Plan Driven virtual tour, featuring Fusion Photography! 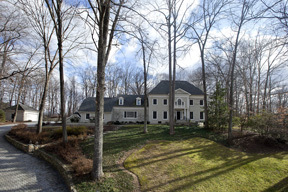 Next is 8620 Chateau Drive presented by Marsha Schuman of Washington Fine Properties. If you are looking for lots of space in a wonderful setting, you’ve come to the right place. With over 10,000 sq. ft. of finished space, there are fabulous entertaining areas as well as cozy spaces for more casual family living. Ideally located in close-in Potomac, public and private schools are some of the area’s best. The HomeVisit Virtual Tour features stunning Fusion and Elevated Photography. Finally, we are proud to showcase 4301 Argyle Terrace, presented by Kimberly Cestari of W.C. & A.N. Miller. This 1926 Italian Villa in Crestwood with soaring ceilings and exposed beams feels like Old World Europe, yet its gourmet Kitchen and updated Baths have modern living in mind. This listing was featured recent in both Curbed and Urban Turf. Be sure to check out the HomeVisit Virtual Tour to view the amazing details of this wonderful home. See them all in person this Sunday, March 11th!